We're pleased to let everyone know that starting Monday March 19th, we'll begin a Monday Morning Zazen starting promptly at 7 a.m. In the almost year since we've been at St. Luke and St. Matthew we've met mostly in the evenings and late afternoon. We're eager to expand our hours to provide those of you a quiet space to start your week. For anyone who's developed an early morning yoga or running practice, you can attest to what an impact an early morning ritual can make on the rest of your week. 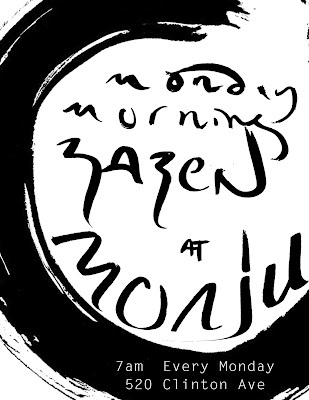 *note: practitioners are welcome to join one or both zazen sessions. If only attending the 2nd, please wait outside until the door is opened during Kinhin at 7:25. This will also be the time anyone who wants to leave after the first session can do so. If anyone has some early rising friends please pass along the message and don't hesitate to reach out with any questions. As always zazen is a suggested $5 donation. Excited to expand our practice into the early parts of the day. Hope to see you bright and early.